Lat 7° 1' 60S Long 147° 4' 0E Salamaua is located on an isthmus on the north coast of New Guinea, south of Lae. to the south is Bayern Bay and north is Samoa Harbor both inside Huon Gulf. On the mainland of New Guinea to the south is Logui the location of Salamaua Airfield (Logui Strip No 2). 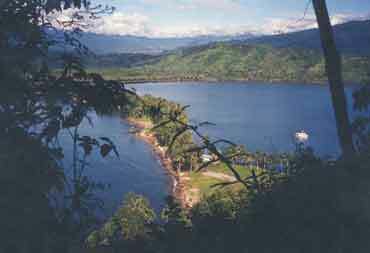 Salamaua town was developed as a hub for coastal shipping and to supporting gold mining operations inland at Wau. Buildings and facilities were constructed on the isthmus. On January 21, 1942, Japanese aircraft attacked Salamaua, including A6M2 Zeros from Shōkaku strafing the town and five Zeros flew inland to strafe Bulolo. The next day, the Australians evacuated the town, fearing further attacks. On March 8, 1942 Japanese troops from Rabaul landed at Salamaua and Lae, occupying the area. During early March 1942, Captain Allan Cameron arrived at Salamaua and was stationed at Salamaua Airfield. On March 8, 1942 before dawn, the Japanese Army, South Seas Force, 144th Battalion under the command of Major Tadashi Hori landed at Salamaua. "Salamaua was the target of a raid by 75 Australian commandos on June 29 , 1942 and another raid a few days later. There was intense interest by Allied intelligence in reconnaissance photos of the Salamaua peninsula from about the 28 June to about the first week in July 1942. I have yet to find any aerial photos of this period. The interest is over a house that sat high up of the seaward end of the peninsula above the tennis courts that can be seen in pre-war photos. The house belonged to Mr O'Dea a prewar pilot and it was the target for a raid by several Australians." The Salamaua area was turned over to the Japanese Army on November 15. After the fall of Buna and Gona, the Allies began to attack Salamaua as a diversionary effort designed to divert enemy attention from the Allied attack on the Nadzab and Lae. By early September 1943, the Japanese were ordered to prepare to fall back to Lae in face of the approaching Australian Army 5 Division. 5,000 that were transported by barge to Lae, an additional 600 escaped aboard a submarine to Rabaul and 200 that trekked overland to Lae. On September 12 , 1943, Salamaua was liberated by the Australian 5 Division, 42nd Infantry. Located on a hill top inland from Salamau. A steep path leads up to four Japanese guns with commanding views of the harbor. Near the start of the path is an entrance to a Japanese tunnel. "I had an experience once, we were on a flight over Lae and Salamaua looking for a destroyer, reportedly up a creek. We knew there was no creek there, but were told to look at the area. We were flying along, fat dumb and happy and all of a sudden, all hell broke loose with anti-aircraft fire was all around us. We could see it we could hear it, I did a quick wing over and got out of there but we weren't touched." Location where Australian Coastwatcher was stationed to report Japanese shipping and troop movements. A full days walk to the Mount with spectacular views of huge battlefield where Australians met the Japanese advance towards Wau. Also known as "Mt. Tambu". Local guides are available for those who want to make this trek. By August 20, Japanese abandoned their defensive positions on Mount Tambu and Komiatum Ridge and are manning last-ditch defensive position at Salamaua.